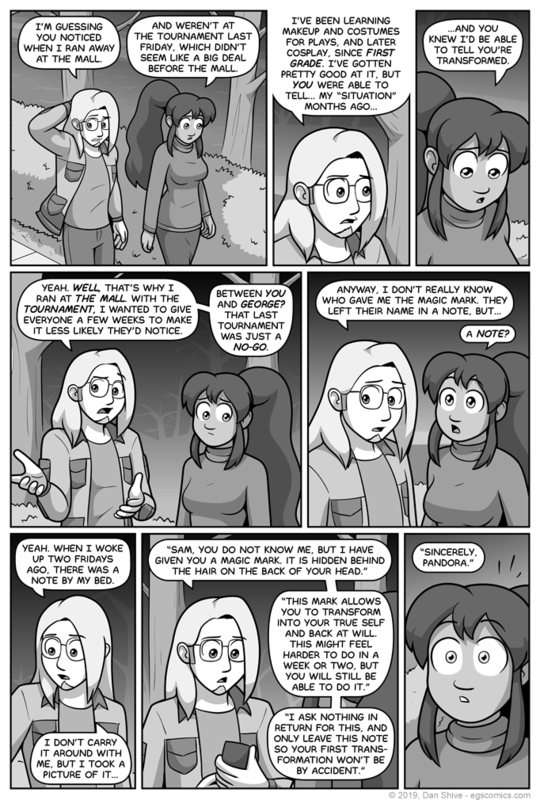 EDIT: This comic originally had a timeline error in the dialogue in which Sam said "last Friday", implying the Friday of the most recent tournament, when it should have been TWO Fridays ago, AKA the day of his not-date with Sarah. I posted this at about 3am my time, and the error was only there for about a half hour, but it did not go unnoticed. And here we are. One of Pandora's final acts before resetting, and the last bit of information Grace needed before the unleashing some deduction. Speaking of deduction, Grace can't sense magic marks. She deduced that Sam had a mark based on being able to tell he was transformed and his recent behavior. I considered having Sam memorize the note verbatim (a bit much, given Pandora's writing, no matter how attached to the note Sam might be), or simply have it conveniently on him, for... SOME reason. I like the alternative I went with, because I would totally have taken pictures of such a note were I in Sam's shoes, and of course Sam has his phone on him. And finally, a confession: I totally didn't think of the obvious "making it less likely everyone else would notice, too" aspect of this until the day I made this. I was just thinking "oh, he doesn't want Grace to see him, because he figured she'd be able to tell", but... There are people he regularly plays card games with, too, and GEORGE. Ye gods, GEORGE! Yeah, there were several reasons to skip a couple tournaments if hoping for a transformation, however relatively subtle, not to get noticed.